The sun is shining. The sands are warm. You’re ready to accept the invitation the beach is offering. Then you take a look at your beach chair. It’s old, heavy, and difficult to carry. Should you try to carry that chair with you? Or should you just leave it at home? When you own one of the best packable beach chairs with shoulder straps, you never need to ask yourself these questions. Packable chairs fold in a way that makes them convenient to carry. Many are designed to be carried like a standard backpack. In the worst-case scenario, you can swing the chair over a shoulder with one of the straps, keeping both arms free. For many, there isn’t a better way to enjoy the beach. Now it’s your turn to explore the advantages of these ultra-portable beach chairs. Why Are Packable Beach Chairs So Popular? When you own a beach chair that can be folded, then you own something that is easy to carry, for sure. No one wants to lug around a heavy chair when it’s already tough to walk in the sand at some beaches. Despite their lightweight design, this chair design is remarkably tough. You’ll find corrosion-resistant frames, rip-stop fabrics, and a host of features available from numerous manufacturers within this category. Some models have adjustable reclining positions and a built-in pillow that allows you to find the most comfortable position possible. Folding features come in 2 or 3 types of positions to permit the greatest ease in transportation or storage. Cooler bags, cup holders, padded arm rests, and water-resistance are all possibilities as well. The best packable beach chairs have a maximum weight capacity of at least 300 pounds. Many models offer a padded strap to reduce pressure on your shoulders or back when carrying the chair. If you make it to a beach and find that there isn’t any shade available, some manufacturers have even included an umbrella with their design. Most models in this category weigh 6 pounds or less, but even the heavier models are still easy to carry, thanks to this innovative design. 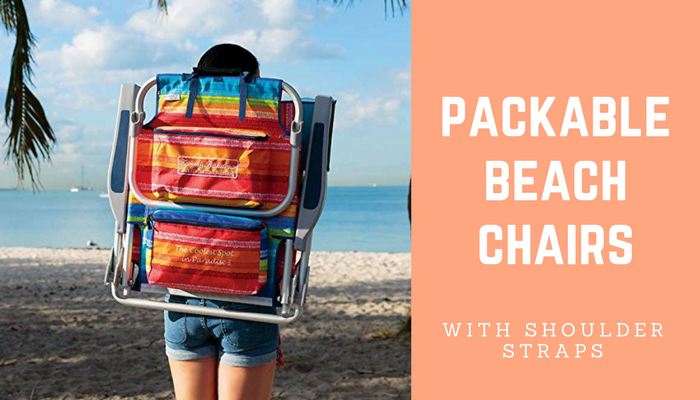 Why Choose a Packable Beach Chair with an Attached Shoulder Strap? Every beach chair has its own unique personality. Your beach chair should be able to be flexible enough to meet changing conditions while still providing comfort. Not every beach is warm and sandy. Cool beaches with pebbles can be just as enjoyable if your beach chair can come along for the ride. By having shoulder straps included with the chair design, it becomes much easier to carry the chair over challenging terrain. 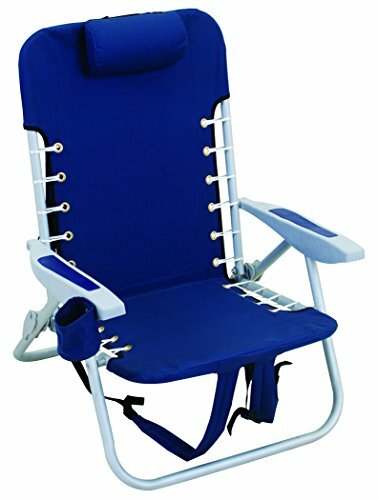 The straps also make it easier to move the chair should the conditions at the beach change and force you to move. You can just grab the chair and go. Then there is the comfort profile of the chair to consider. Beach chairs must be more than convenient. They must also be designed in a way that makes you want to sit in them. Look for models that meet the needs of your body size and type. Never settle for a “generic” chair that says it’s a 'one-size-fits-all' option. These chairs are also designed to be small enough that they can be packed into your luggage for travel. That makes it a lot easier to take your new beach chair on vacation with you… or take it to the beach that is right down the street. 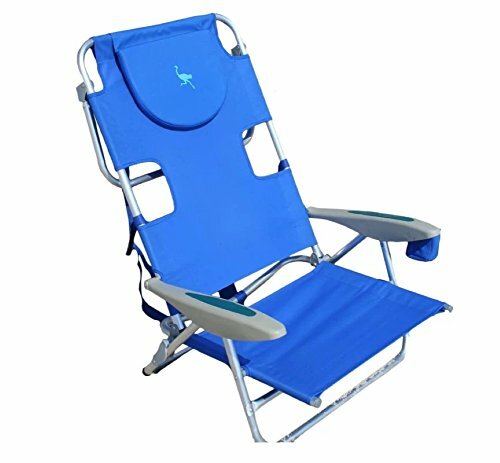 The best aspect of owning a modern packable beach chair is the overall versatility of its design. With the included shoulder straps, you can take this chair with you, no matter where your journey may go. You can take this chair design on your next camping trip. They’re perfect to take along when you set out on a long hike. Headed to a concert or a festival? Bring the chair along and you won’t be forced to sit on the ground or along a wall. If you need a chair somewhere, then this is the design to take with you. It is lightweight, comfortable to carry, and sturdy enough to handle almost every environment. 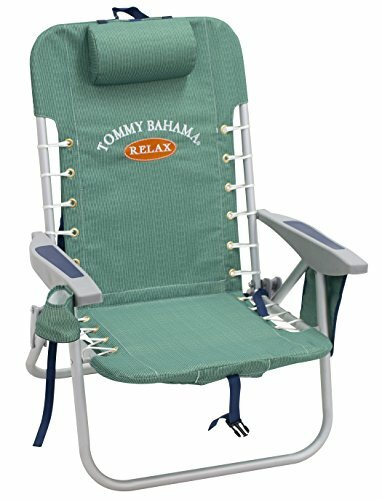 The best packable beach chairs with shoulder straps are perfect for any age. Whether the kids want to have a fun day of exploration or you want to have a fun day exploring a world with nothing to do, this chair design is for you. It is simple, strong, and ready to meet your needs today.